North Africa comprises Egypt and the lands to its west, known in Arabic as al-Maghrib, literally "the place of sunset": Libya, Tunisia, Algeria, and Morocco. These political divisions were essentially established by the Ottomans in the sixteenth century, but throughout history this part of Africa has been affected by, and has had a profound effect upon, the regions that surround it: the Mediterranean, sub-Saharan Africa, and the Middle East. It is impossible to appreciate one region without knowing something of the history of all; the style and patterning of dress provides one means of reading that history. The climate and topography of North Africa is extraordinarily varied. The peaks of the High Atlas mountains of Morocco tower over 13,000 feet, whereas oases in the depressions of the Libyan Desert descend to sea level or below. The mild, temperate conditions of the Mediterranean and Atlantic coasts give way to the searing daytime heat and freezing nighttime temperatures of the desert lands to the south. 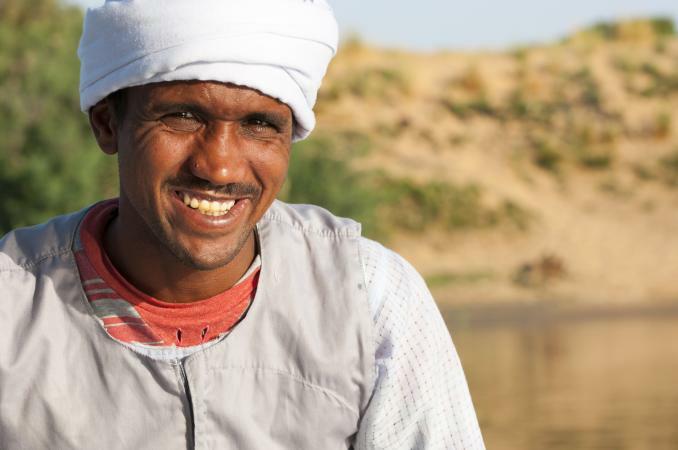 Crops and vegetation thrive on the fertile northern plains and along the Nile valley, whereas scarcely anything grows in the desert save in the lush oases where the water table is close to the surface. Ancient Egyptian art gives us a fairly detailed picture of how people in this part of North Africa dressed, at least as far back as 5000 B.C.E. Elsewhere, the extraordinary rock paintings of the Sahara, the Atlas Mountains, and the Nile valley, dating from c. 12000 to 3000 B.C.E., give us an idea of how people might have dressed when the interior of North Africa had a much wetter climate, supporting animals such as hippos, elephants, giraffes, and rhinos. In the ninth century B.C.E., Carthage was founded near the modern city of Tunis; the Carthaginians traded cloth and other luxury goods across the Sahara in exchange for slaves, gold, and ivory, a pattern continued by the Romans following the sacking of Carthage in 146 B.C.E., only declining when the Portuguese and other Europeans began to trade along the west coast of Africa in the fifteenth century. Roman mosaic pavements from Carthage show garments that bear a remarkable similarity to tunics worn in the early twenty-first century as part of a woman's wedding costume in the Tunisian town of Mahdia. In the seventh century, Muslim armies invaded North Africa and began the process that, despite resistance from the indigenous Berber peoples, culminated in the establishment of the Hispano-Moresque civilization; this society flourished in the Maghrib countries and southern Spain until the fall of Granada to Christian armies in 1492. After that event, many Muslim and Jewish artisans, including weavers and embroiderers, sought refuge in the large towns of North Africa, and at this point, a particular pattern of production, use of materials, and division of labor, which has remained essentially unchanged, was established. 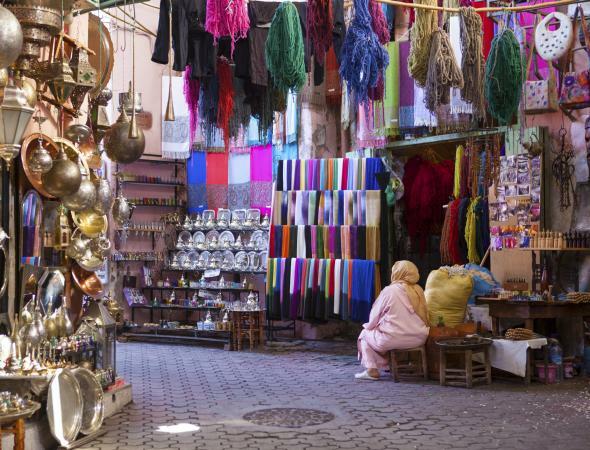 Walk through the marketplace in any North African town, from Cairo to Marrakech, and at first glance you will find people dressed no differently than city dwellers in any other part of the world. Many male professionals and office workers wear a suit and tie, or possibly some version of the "safari" suit. Many women wear an equally conventional two-piece top and skirt, though most wear the Hijab, the Islamic head covering. Younger people of both sexes wear jeans, T-shirts, or football shirts. Among these now ubiquitous "Western" garments, however, people wear more obviously local fashions. Many working men in Cairo wear djellaba, the long, loose-fitting gown, sometimes in combination with the kaffiyeh, a turbanlike head cloth or cotton skullcap; older women may wear burqa and bedla, a black headscarf and flowing dress. In Tunisian towns, the red felt chechiya, a cross between skullcap and beret, is still the single most distinctive item of male attire, while in much of the Maghrib the burnoose, a hooded cloak, is worn by many men. In rural regions, the cut and sewn garments of the city tend to be replaced by single-piece draped or wrapped clothes for women, secured by a fibula, or cloak pin. Berber women of the Atlas Mountains of Morocco wear elaborate headdresses on certain occasions, whereas men may wear large woolen cloaks or knitted "long johns" while herding their flocks during the winter. Socalled "granny" dresses-often featuring "foreign" elements such as cuffs, collars, pockets, and pleated hems-are commonly worn by women in rural communities of North Africa. Variations on this style, based on European dresses of the eighteenth and nineteenth centuries, may be found in many other parts of the world, including the islands of the Pacific Ocean. However, the costumes worn for special occasions, particularly marriage, emphasize the real differences between town and country styles. In North Africa, as in all Muslim societies, marriage is seen as the ideal adult state. Clothing for both bride and groom reflects their new social status as well as concerns over modesty and fertility; perhaps most importantly, clothing is seen to ease transition from the unmarried to the married state. As elsewhere in postcolonial Africa, the popularity of "traditional" attire has fluctuated according to political, religious, and economic circumstances. The dictates of fashion and the desire to appear modern has made the white European wedding dress a popular choice, though often dress designers have come up with styles that incorporate something old and something new, thus satisfying the desire to be both fashionable and culturally aware. The names of certain wedding garments in North Africa suggest one or more of the ceremonies marking the different days of the marriage festivities; for example, mwashma (painted), an elaborately embroidered dress from the village of Raf Raf in Tunisia, evokes the laylat al-henna, or "night of henna," when the bride and groom are tattooed with henna to bless their marriage and encourage the birth of children. The simple, T-shaped cotton tunics worn by the bride in Siwa, Egypt; Ghadāmis, Libya; and Mahdia, Tunisia, probably share a common ancestry with certain garments that appear in the mosaics of Roman Carthage. These loose-fitting, yet elaborately decorated dresses are designed to show off the status and beauty of the bride while preserving her modesty; they can also accommodate up to seven more garments beneath them, which are revealed to the bride's and then to the groom's relatives during the jilwa ceremony. Similar patterns are known by different names in different regions of North Africa and do not necessarily have the same significance. However, universal concerns regarding protection from harm-and, by extension, promoting good luck, health, and fertility-are preoccupations that inform the patterning of artifacts throughout the region. Concerns about the harmful effects of envy, focused in beliefs surrounding the evil eye, are often manifest in the form of patterning applied to marriage costume in particular, though such designs may perform a host of additional functions. The bakhnuq, a marriage shawl from southern Tunisia, is woven in a combination of wool and cotton that, when dyed, reveals the white cotton motifs resistant to dye. 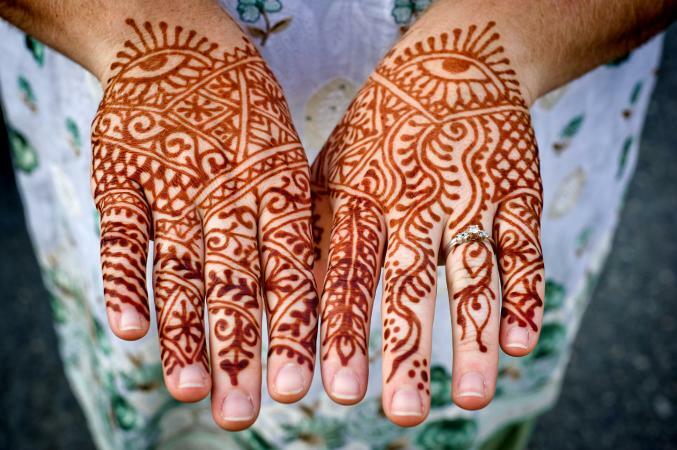 These motifs suggest items of jewelry and the pattern of women's tattoos, but also snakes' vertebrae and sharp cloak pins to repel or pierce the evil eye. The different colors of the bakhnuq traditionally indicate women's status: young, unmarried girls wear white; married women of child-bearing age don red, while older women wear black or blue. The wedding dresses of women from the oases in the Western Desert of Egypt, with the exception of the oasis of Siwa, display unmistakable similarities to the embroidered dresses of Palestine, reflecting a long historical connection between the two regions. In the 2000s these dresses are only worn by older women, but they still display the very distinctive patterning, color, and style of embroidery peculiar to each oasis, and sometimes even to individual villages within the same oasis. The embroidered bodices of these dresses, embellished with numerous sequins and sometimes small coins to deflect the evil eye, are a certain way of establishing the identity and affiliation of the wearer. For example, the bodices of dresses from Bahriya oasis are invariably made up of rectangular areas of embroidery with distinctive tassels on the shoulders and chest; the dresses of Daqahlīya oasis, by contrast, have a quite different pattern of embroidery on the bodice, with a central section tapering to a point. The patterning applied to male clothing reflects similar concerns. The woolen tunics, gandura, woven by women for their sons in the remote M'zab region of southern Algeria include named motifs, such as "birds with their young" and "a table of guests," emphasizing fertility and harmony; other motifs, such as forks and weaving combs, have the added dimension of sharp implements with the ability to pierce the evil eye. The patterning, color, style, and design of dress and textiles in North Africa suggest clues that, through painstaking research, can be pieced together to provide a more detailed and reliable picture of the past than any written record. Few, if any, of the distinctive features of dress happen by accident or whim; many tell of the movements of people through warfare, religious persecution, trade, economic necessity, or natural disaster. Often this story goes back many centuries, perhaps reaching outside both the region and even the African continent, each event being recorded in a series of details that have gradually evolved into the form of modern dress. The machine-embroidered wedding dresses worn by women of the Jewish faith in urban Morocco are developments of the elaborate, hand-embroidered dresses of the nineteenth century. These in turn can be traced back to Spanish styles of the late Hispano-Moresque period, brought to Morocco by Jewish craftsmen expelled from Andalusia during Christian persecution of the fifteenth and sixteenth centuries. These craftsmen settled not just in Morocco, but in major urban centers throughout the Maghrib. From the sixteenth century, Ottoman influence began to spread throughout the region, and many of the floral motifs that appear on textiles, such as the tanshifa of Algeria, and the 'ajar and rida' ahmar of Tunisia, are of Turkish inspiration. The first two are no longer worn, but the rida' ahmar remains the most prestigious item of clothing worn by women of the town of Mahdia. At each end of this silk wedding veil is a set of design bands woven in silk and gold thread. The central band known as dar-alwust (literally "the house in the middle") represents a mosque in stylized form; at the other end of the cloth, the dar-al-wust features two motifs in the form of the Star of David, an element of the design that continues to be included by the Muslim weavers out of respect for the Jewish weavers who once produced this garment. Female weavers in the old silk-weaving town of Naqâda, in the Nile valley of Egypt, produce a style of shawl that has a similarly complex history. Using a tapestry weave technique widely practiced in Damascus and elsewhere in the Levant, male weavers of the nineteenth century produced the aba, a man's gown, as well as other garments such as the cotton and silk modesty garment worn by women of Bahriya oasis in Egypt's Western Desert until it began to go out of fashion in the mid-twentieth century. In recent years a collective of female weavers, taking over what had previously been an exclusively male profession, began to weave this shawl, using the same looms and weaving techniques, but in gaudy, two-tone rayon, rather than in silk and cotton. Their new markets were initially in Libya and Sudan, but when these dried up following political differences between the three countries, the women found other outlets in the tourist trade in Cairo from where these textiles are today exported to various European countries. Distinctive ceremonial costumes continue to be produced by weavers and embroiderers in different parts of North Africa, displaying the dynamism with which textile traditions throughout Africa have developed since antiquity. Despite the clear influences that have helped to shape North African cultures, an internal dynamic has molded these elements into the distinctive material culture characteristic of each region. See also Sub-Saharan Africa: History of Dress; Burqa; Djellaba; Hijab; Kaffiyeh; African Textiles. Besancenot, Jean. Costumes of Morocco. London and New York: Kegan Paul, 1990. Detailed paintings and drawings made by French artists working in Morocco during the 1930s; text in English. Cuenot, Joel, ed. Noces tissées, noces brodées: Parures et costumes féminins de Tunisie. Paris: Editions Joel Cuenot, 1995. Exhibition catalog (text in French) with useful essays and many color photographs of traditional Tunisian female costume and jewelry. Reswick, Irmtraud. Traditional Textiles of Tunisia. Los Angeles: Craft and Folk Art Museum and University of Washington Press, 1985. Survey of Berber textiles from rural Tunisia, including many technical details of weaving. Rugh, Andrea. Reveal and Conceal: Dress in Contemporary Egypt. Cairo: American University in Cairo Press, 1987. In-depth study of the social significance of costume, both male and female, in late twentieth-century Egypt; numerous black and white illustrations. Spring, Christopher, and Julie Hudson. North African Textiles. London: British Museum Press, 1995. Survey of the region, with additional information on Sudan and Ethiopia, and with an emphasis on the symbolic and social significance of dress; draws on the British Museum's collections and the fieldwork of staff and colleagues. --. "Urban Textile Traditions of Tunisia." African Arts (forthcoming). Fieldwork-based article detailing the production and use of urban costume in Tunisia, 1997-1998; many color photos of weavers and embroiderers and their products; also refers to Tunisian contemporary artists working in the medium of textiles. Stone, Caroline. The Embroideries of North Africa. London: Longman, 1985. Separate sections on Tunisia, Algeria, and Morocco as well as Turkish embroideries and their influence on North Africa; useful technical information on stitches and applications.